Sneaking in for lunch, to serve up a soupish risotto that we had on Saturday, when my parents and nephew came for a visit. I see now I could have, and probably should have, scooted another bowl into frame, or the pile of spoons to my right, as this recipe makes a big ol' potful, and feeds a gang with abundance. But I was distracted, because of a rousing game of Battleship, because of a convoluted plan to secure my older brother's birthday gift, and because I was hungry. So a lonely, single serving it is, with a timid-seeming slouch of green and bronze and black. Still, it gives a good idea of everything you need to know. The soup is maybe more of a stew, but either way, it is resolutely savoury, with a base of onion and anchovy upon which a risotto is started. Atop that goes handful after handful of the thinnest slivers of kale you can manage. It cooks some more, to tender acquiescence, until the greens and grain are languid in a saline slip of broth. But then, oh then, we loosen the business with more stock, then stir in bouncy quinoa, and walnuts that have been toasted and so strike an aromatic note that verges on sharp. The effect is taken to full-throated cheer by an exuberant amount of lemon zest and oil-packed chilies. It's the last few minutes there, the last few ingredients that change the soup's character entirely. Now it comes across loud and clear; it is a soup that exclaims. The effect is ebullient, energy-enhancing, and bracing, simultaneously substantial and soothing while clearing the head and nostrils, and setting shoulders straight. The soup requires taking breath around each spoonful, the extra air needed for balance. It is mostly vegetables, granting a sense of piety and wholesomeness, toothsome without excessive weight. After the roasts, braises, gravies, marshmallows and custards of our lately, it was the jostling we needed. Though I've not tried her recipe, this reminds of the cabbage and rice soup from Molly, via Luisa, that came from Marcella Hazan. I like how that version is all softness, harmonious with butter and a generous amount of cheese, and is closer to the recipe upon which this is based. I'll be making that one soon, when the momentum of this one wanes. Hope your days have been happy and merry, and here's to the brightness ahead. Cheers, all. A soupier, brasher, even more kale-packed adaptation of a recipe by Martha Rose Shulman via the New York Times. In a saucepan, bring the stock to a simmer. Heat the olive oil in a wide, heavy saucepan over medium heat (I used a 5-qt Dutch oven). Cook the onion with a generous pinch of salt until tender but without colour, around 3 to 5 minutes. When you think the onion is about a minute away from being ready, add the anchovies, stirring them into the onions and breaking them up with the back of the spoon. Tip the rice and garlic into the pot, and stir until the grains separate and start crackling, around 3 to 5 minutes. Add the wine while still stirring, and continue until it evaporates. Pour in about 1/2 cup of stock, and cook, stirring regularly, until the liquid is just about absorbed. Add another couple ladlefuls of stock, and continue in this fashion, stirring in the stock then adding more once the rice is almost dry. After 10 minutes, start adding the kale, in batches as necessary. Cook as before, with regular additions of stock, then stirring in between, until both the rice and kale are tender. Stir in the black quinoa, most of the walnuts, the Parmesan and lemon zest. Pour in enough stock to wet everything to your liking, giving it all a few good turns in the pan to give the broth a chance to thicken. It should be lush and creamy. Check for seasoning, then serve straight away with more cheese, the reserved walnuts and the peperoncino. I'm here to talk about salad. If that's not your thing, I still hope you'll stick around. This is a salad to get to know, with an exceedingly useful dressing that I'm keeping on speed dial. To those of you for whom, like me, salad is entirely your thing — hey, good to see you. This is a pretty basic salad. Its bulk is kale, either curly shreds of the big stuff or the petal-like leaves of the baby kind. Up to you. The rest gets made up of spindly, twisty sprouts, which interrupt the density of the kale, and enough apple keep things juicily crisp, because, let's be honest, while kale salads offer a jaw-tiring chew, the leaves lack a proper, snappy crunch. A scatter of nuts, and, all that's left is the dressing. If you don't mind me saying, I think the dressing is terrific. Fist-bump, high-five, secret handshake terrific. It is made with miso and tahini, and the two meld in this gorgeous way; the softness of the miso lightening the tahini's clay-like texture until it relaxes. The orange juice lends a perked sweetness, floral and fragrant, and the garlic grounds everything to its background buzz. The rest of the suggested ingredients — rice wine vinegar, honey, a few drops of oil — are there to finesse the dressing into its final harmony, into a concoction with surprising depth and interest. You know what it's like when you wear a perfectly-tailored coat with an old pair of jeans? The dressing in here works something like that. It's not flashy, but it'll turn heads. I double dog dare you not to lick the bowl. Last night I realized I smelled like dirt. And sunscreen. And grass, right here at my elbow, where there was a stain from leaning into the lawn. After dinner outside, a dinner that included this salad, William and I had been trying to keep track of a bird that was hopping from branch to branch in the trees above us. We kept losing it in the sun. Benjamin wanted to see what we were looking at. I stretched back onto one arm so he could rest his cheek close to my shoulder and follow the other, which I extended to point. The recipe for the dressing makes more than needed for one batch of kale salad. I store the remainder in the fridge, and use it up fairly quickly; as employed here, or alongside roasted root vegetables, or spooned over a halved avocado. Kale is a sturdy green, so can stand up to both an assertive dressing and a thorough leaf massage. Don't hold back on either. Sort the dressing first. In a mortar and pestle, pound the garlic into a paste. Stir in the miso and tahini, then most of the juice from the orange. Season with salt and pepper, then taste. Here's where you'll have to decide how best to proceed; fiddle with the dressing until there is a balance of fat and acid. You'll want to smack your lips when it's right. You should be able to taste the orange — give it a boost if necessary with more orange juice, and maybe a scant spoon of honey. If the dressing tastes flat, add lemon juice or rice wine vinegar. The dressing should be the consistency of pouring cream; stir in some water, or a few drops of either of the oils, until it runs easily off the spoon. To assemble the salad, grab a large bowl. 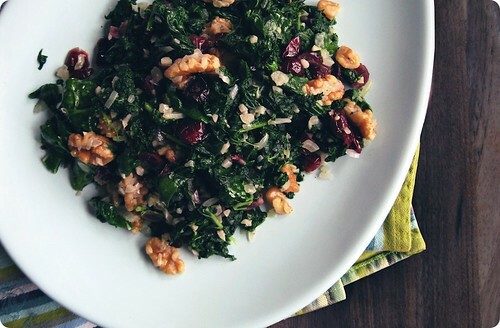 Tear the kale into bite sized pieces, and add to the bowl along with a few tablespoons of the dressing. Using your hands, squish and bruise the kale, working the dressing into the leaves. Once completely coated, toss the kale lightly to fluff it up. Set aside. If desired, toast the seeds and nuts in a dry skillet over medium heat. Cool. Cut the apple into eights. Remove the core from the wedges, then slice thinly. Add to the bowl of kale, along with the sprouts, half the seeds, and another drizzle of dressing. Again with your hands or a pair of tongs, toss the salad with the dressing. Check for seasoning and serve, topped with the reserved seeds and nuts, and extra dressing at the table. P.S. Emma of My Darling Lemon Thyme recently asked me to participate in an interview, and I'd like to thank her for that. Today is Monday dressed up in Thursday's clothing. Of this, I am certain. Unexpected company for the last two days led to Tuesday and Wednesday's schedules taking on the traits of Saturday and Sunday respectively, with a weekend-ish pace to boot. But that didn't mean we were exempt from the requirements of midweek days, so that was packed in too. Today is back to its usual routine, behaving decidedly like the start of the week rather than the end. But the calendar says it is Thursday, and the fourth Thursday of November at that, which makes it American Thanksgiving. But then, all the chatter about turkeys and pies and pumpkins conjures memories of the Canadian holiday of the same name, which we celebrated in October. On the second Monday of the month to be precise. Here we are, back to Monday. On Thursday. I'm not sure if I should be coming or going, getting ready to face a new week or eager to bid goodbye one. Thank goodness that on this Monday-ish Thursday there is still some kale around. Kale might not sound like a consolation, but when your mind is awhirl, a plate of kale is as good as a spot as any to choose to settle gently. In fact, I would say that on a rainy fall evening that nothing is more soothing than sitting someplace comfy, tucking your feet up, and scooping up your supper by the emerald forkful. This kale is roughly torn, with some of the bitterness blanched out of its leaves before it slumps into a pile of soft onions and garlic. As it hits the heat, the resulting steam is savourily-aromatic, damp and dense with the vegetal essence of sturdy greens. After cooking the kale softens to supple leatheriness, its sinewy leaves still hale and hearty but more relaxed. Fleshy crowns of walnuts add autumnal bulk, and cranberries give both a tempered sweetness and an appreciated touch of acidity. The final effect is one of Rudolph among the evergreens, complete with the white flecks of a light snowfall; and as this Thursday is the last before December, it might be perfect timing. A interpretation of recipes from Gourmet, available here and here. Boil the kale until bright green and just tender, about 5 minutes. Immediately plunge the greens into a bowl of ice water to stop the cooking. Once cooled, drain well but do not squeeze. In the same pot over medium heat, melt the butter with the olive oil. Add the onion and cook, stirring occassionally, until the onion is fragrant and beginning to turn translucent, about 2-3 minutes. Stir in the garlic and cook for 30 seconds more. Tumble in the walnuts, tossing to coat well with the butter/oil. Continue to cook until the nuts are golden and lightly toasted, around 2 minutes. Stir in the cranberries. Using your hands or tongs, separate the kale as best as you can and add to the pot. Stir to combine, and continue to turn the leaves through the onion and walnut mixture until they are warmed through and softened. Season to taste with salt and pepper.